Gift cards can be purchased towards products or services of your choice. 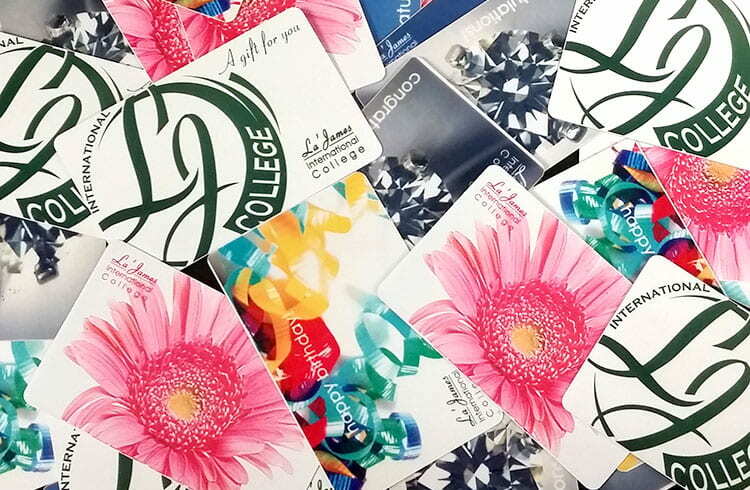 They don’t expire and can be used at any La’ James International College location. Call 888-880-2106 and press 2 for Guest Services to order your specialized gift card for any amount or occasion and we can mail it out today! Don’t forget to ask about our current specials! Prices and the availability of services are subject to change without notice. The following payment options are available to pay for the gift card. Please note it may take up to 24 hours for payment to process through PayPal. If you would like your gift card mailed the following business day, please choose the option to call Guest Services to process your payment by phone. Please select amount to pay online using PayPal. If you have elected to pay online using PayPal you will be redirected following the form submission. You will receive an email confirmation when your gift card is mailed to the address provided.